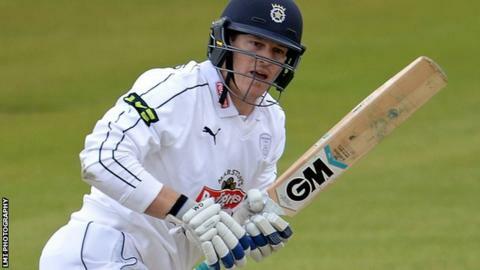 Hampshire batsman Jimmy Adams has officially stepped down as captain having previously handed over the role to focus on his batting. James Vince was appointed captain in July in all formats for the remainder of last season. Adams, 35, has a year remaining on his contract at the Ageas Bowl and was awarded a benefit year for 2015. "It's been a great honour to captain Hampshire, but now is the right time to move on," he said. Adams took over the captaincy reins from Dominic Cork at the end of the 2011 season. Jimmy Adams scored a century and two half-centuries in his last four first-class innings of 2015. He scored 760 runs in 15 County Championship appearances at an average of 27.14 with a highest score of 136. The left-hander led Hampshire to the CB40 one-day trophy in 2012 and the County Championship Division Two title in 2014 during a hugely successful spell as skipper. "It was certainly tough at times, but I can look back on my time as captain with fond memories," he added. "I'd like to think we've moved in the right direction since I took over." Adams' decision to relinquish the captaincy in July paid off as he helped Hampshire avoid relegation from County Championship Division One on the last day of the season.